Five grants were awarded this school year. The SEFT funded: : A performance for middle and high school students by John Morello - themes include substance abuse, bullying and tolerance; story teller and writer, John Porcino, teaches writing to all students in grades 3 to 5. Varsity Math Team competition; purchase of standing desk for middle school; Peer and Teacher anti-bias training. John Morello helps students recognize and deal with difficult problems by performing a one-man show called “Dirt”. Dirt resonates with students in a real and meaningful way and focuses on key issues like drugs, bullying, and self-esteem. A grant was written to the Massachusetts Cultural Council to bring in Story Teller and Writer, John Porcino, of Amherst, Massachusetts to teach writing to all students in grades 3, 4, and 5. 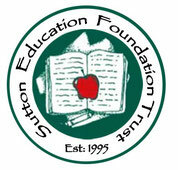 The objective of the grant is to enrich the writing experience for all children in grades 3 – 5 in Sutton Elementary School. The students wrote personal narratives, fantasy stories, and informational writing. Each class was provided with 5 hours of instruction with a total of 70 hours for all classes in grades 3 – 5. SEFT funded the remaining cost of the program. The students I am hoping to support have been diagnosed with various learning disabilities, ADHD, and/or emotional disabilities that make it very challenging to remain seated throughout the school day. Research suggests that standing increases on-task behaviors, alertness, stimulation, and classroom engagement. Maintaining a low level of activity, such as standing in the classroom, results in greater student attention and increased achievement. SEFT has funded 8 desks for the students. Sutton High School is taking active steps to work with our students around issues of equity and diversity. Working along with the Anti Defamation League, the High School will develop curriculum and training for students and staff on how to challenge issues of bias and intolerance - in our community and in the world. The project will directly serve 25-30 students and the entire HS faculty. SEFT will partially fund the varsity math competition at Assabet Valley Regional Technical High School in Marlboro, MA. Students will work together in groups, not just composed of their classmates. A well-constructed team will highlight the strengths of the students making up the team. There are several topics that are beyond what the underclassmen have learned. The upperclassmen will coach, tutor, and advise these younger students.